In order to get you prepared for the APELAC course, you are required to complete two summer assignments. If you fail to come to the first day of class without the work completed, you may be dropped from the course. Read and take notes on Chapters 1-3 in The Language of Composition textbook. You will need to get this textbook from Mr. Nittle before the end of school on Thursday, June 4. You should have a minimum of four full pages of C-notes for Chapter 1, two full pages for chapter 2, and two pages for chapter 3. Therefore, you should come to class with a minimum of 8 full pages of C-Notes. Pay special attention to the rhetorical terms in bold. The definitions to these terms are either embedded in the text, or found in the glossary in the back of the book. 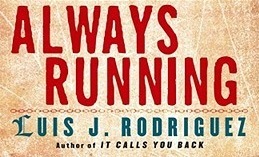 Read Always Running by Luis Rodriguez. You should complete a 2-paragraph journal for every chapter (Preface + 10 chapters) in the text. In your journal you may reflect on what is happening in the story, your feelings about the characters, questions you have about the story or characters, the writing itself, how you think this text compares to other texts you have read or are reading, or anything else you would like to write about. You will turn in 11 journals on the first day of class. Be prepared to take an AR test on the book at the start of the school year. If you have any questions, contact Mr. Nittle. Happy summer reading!